Planting design aims at a combination of spatial, textural, ecological, climatic, functional and symbolic objectives. Typical labels on planting strategy drawings are: enclosure planting; garden planting; shelter planting; screen planting; existing oakwood; proposed oakwood; existing marsh; proposed marsh. Parker and Bryan give the following management objectives: pleasant views; screening or shelter; nature conservation; horticultural excellence; botanical variety; education; sport and recreation; job creation. The particular species will be listed on a planting plan. The planting strategy and management plan should group them and give examples of the dominant species (e.g. shrub roses; oak--birch woodland). How do you intend to achieve the objectives? What ground preparation will be necessary? What species will be used? What size and type of stock will be used? Technical accounts of how planting objectives will be obtained should include information on soil treatment; plant species; type and size of plant material. An oakwood, for example, might be established by erecting a fence to keep out grazing animals, by sowing acorns, by planting one-year-old seedlings or by planting young trees. The soil may be kept in its existing condition, ameliorated physically or ameliorated chemically. Or it may be necessary to import new topsoil. These are all design considerations of considerable importance. Do you recommend whips? 2+1 transplants? Feathered standards? Full standards? Extra heavy nursery stock? Container-grown shrubs? Direct seeding? Turf implantation? Topsoiling? Pit planting? Notch planting? Shrub bed preparation? Cultivation? Soil improvement? Consult price books and specification books for clauses and prices. How will the planting change in time? Clients like to know what a place will look like immediately after planting has taken place and then what it will look like after, say, 5 years, 15 years and 30 years. Sketches and diagrammatic cross-sections are helpful. When will the canopy close? When will it be above eye level? Will there be field layers and shrub layers under the tree canopy? When will re-planting be necessary? An axonometric drawing, from which individual plants could be recognized, is a very good way of conveying the design information. A French computer programme, Amap, produces growth models of plants. What management operations are you committing the client to? Fencing a grass sward and then waiting 50 years, for an oakwood to regenerate, is an inexpensive maintenance operation. Fencing another area of ground, maintaining it free of weeds and irrigating the young oak trees in dry weather, is far more expensive, year after year after year. Clients need to know which sequence of operations you are committing them to. So do your examiners. Will a small ride-on mower be required? Are the banks so steep they will require a hover-mower or strimmer? Will the maintenance operatives need degrees in botany? One way of producing a planting strategy is to take a print of the layout plan, apply textures to different types of area, and produce a key with the textures down the left-hand column and headings, possibly drawn from the above questions, at the heads of the other columns. Then fill in the boxes. Another technique is to use annotated transects. A good reference for the landscape management is John Parker and Peter Bryan Landscape Management and Maintenance (Parker and Bryan, 1989). There are useful tables in Ralph Cobham (ed.) 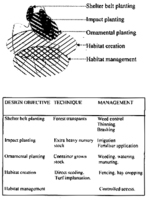 Amenity Landscape Management (Cobham, 1990). In future, landscape architects will have to supply their clients with planting and management information on a GIS-type spatial database.